Step into the epitome of luxury atop the lush dunes of Mango Lane. Accompanied by two trolleys to the private beach and parking area, this one-in-a-million residence is absolutely something to behold. Let the marble floors lead you to the private escape of the hilltop estate with automated blinds and adjustable lighting to accommodate any formal or casual meal. Pass the lavish pool and deckscape to the first floor, with a modern entertainment room and laundry room complete with a wine cellar and sliding barn doors. Sleeping arrangements include an 8-bed bunk room attached to a sizable bedroom with views of the forest and pool. Take a ride in the elevator upstairs where you'll find an open floor plan featuring a formal dining area and two entertaining nooks adorned with alluring Indian inspired art. 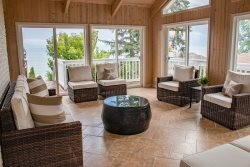 Breathtaking beach views can be seen from the dinner table, decks or bubbling hot tub. Another delicious option would be to spend an evening cooking with family and friends in the spacious kitchen with every appliance at hand. The top floor can be found with two master bedrooms, adjoining bathrooms and a private walk-in closet and laundry. Mango Lane is located in the picturesque town of Sawyer, MI, where you are just a short drive to everything, from the local roasters at Infusco, to the lively and tasty Greenbush Brewing Company. Purchase your dinner needs at the locally sourced Peasant's Pantry and Sawyer Home & Garden Center or take the family out for a night at the farm-to-table restaurant, Mesa Luna. Every amenity is at your fingertips in this beautiful beach side getaway.